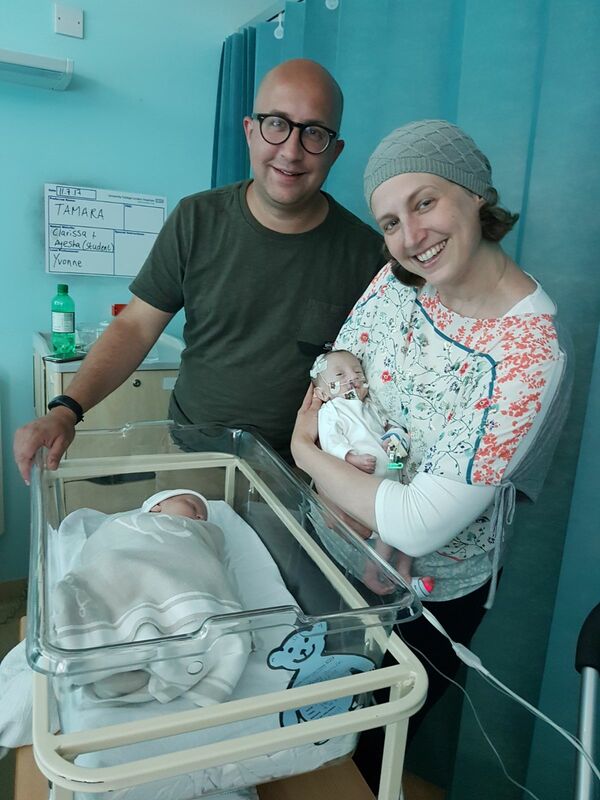 Our son Donnie was born on Thursday 20th April 2017. 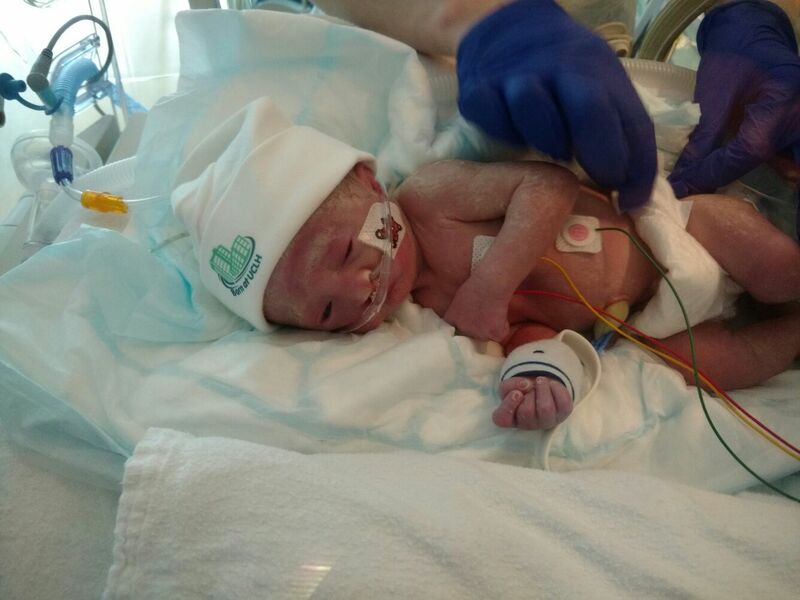 He had Edwards Syndrome and was not expected to live more than a few days or weeks. Shortly before his birth, we started updating friends and family by WhatsApp and SMS on developments and this is a lightly edited collation of those updates. Donnie lived for 142 days and died on 8th September 2017. 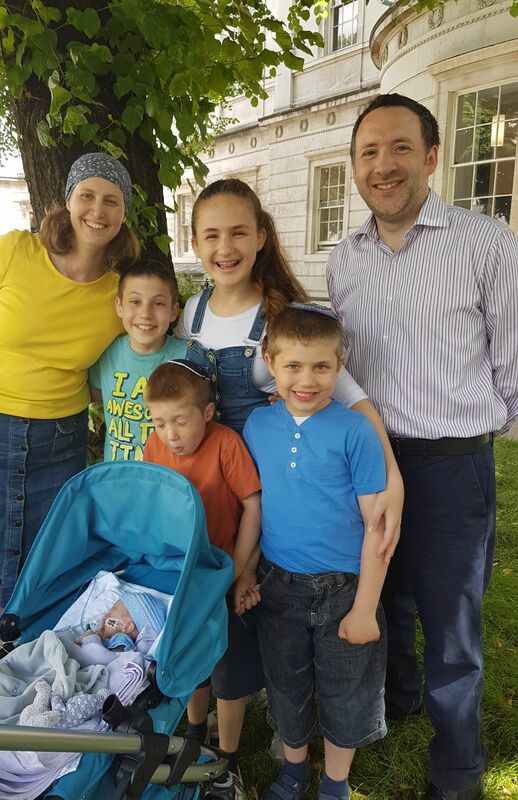 Hi all, all being well, our baby will be named in Synagogue on Thursday morning with his Jewish name as a circumcision is very unlikely. Yesterday was a very tiring day... Lots of cuddles and an amazing photography shoot that the staff organised with a professional photographer who donates her time. We'll share some of those images when they come in ... It may take some time. 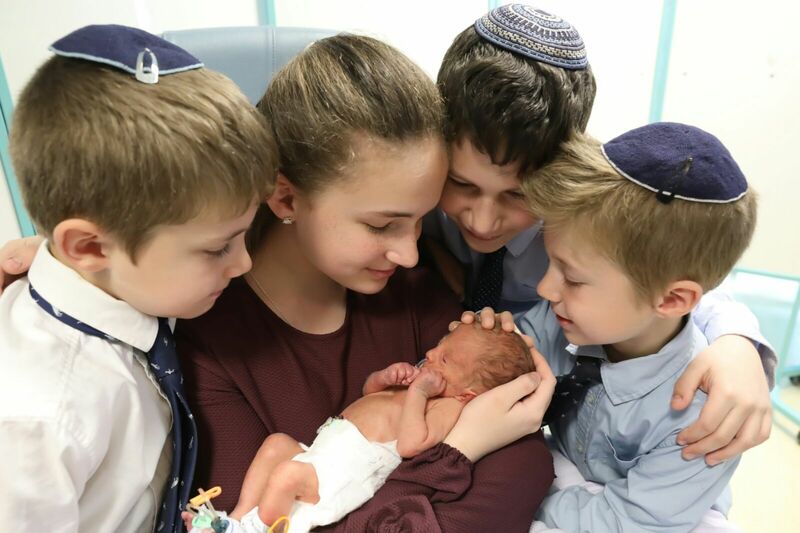 In the meantime, here's a nice one of the soon-to-be-barmitzvah-boy and his brother who was very alert for a long time. 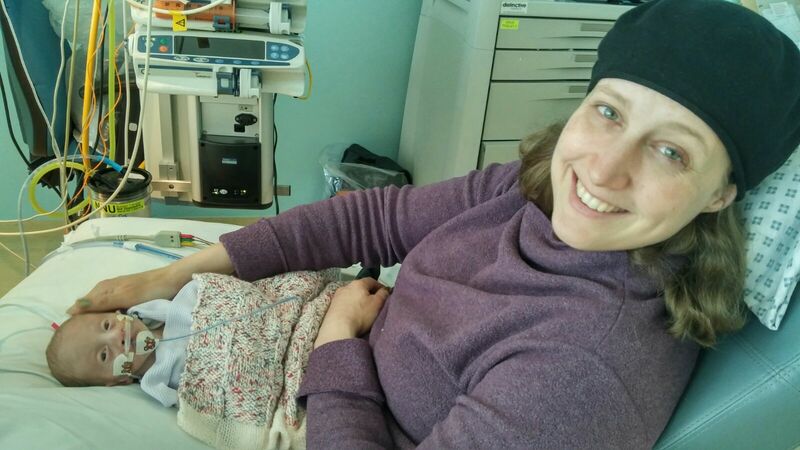 This morning we named our son with his Jewish name Daniel Ephraim. 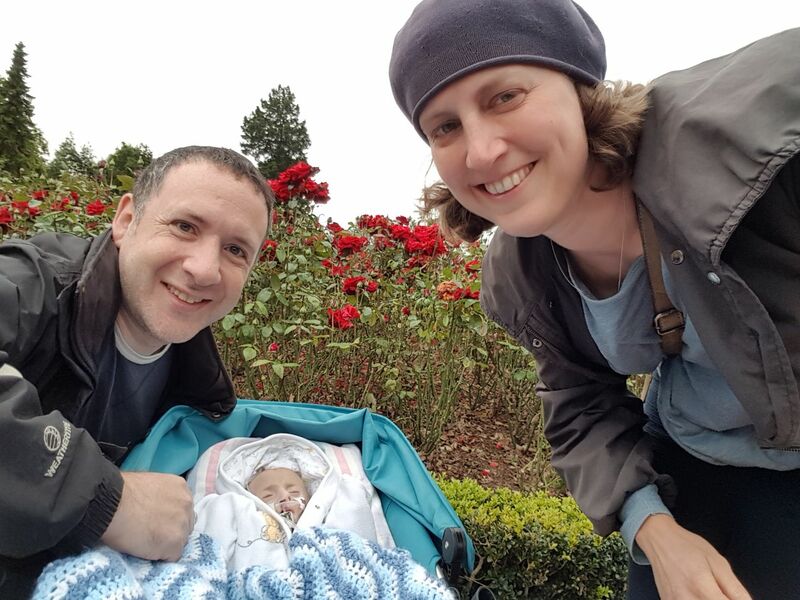 Daniel meaning "G-d has judged me" as we have been judged able to cope with the special demands of the lovely baby we have. I will surely have compassion upon him, said the LORD." 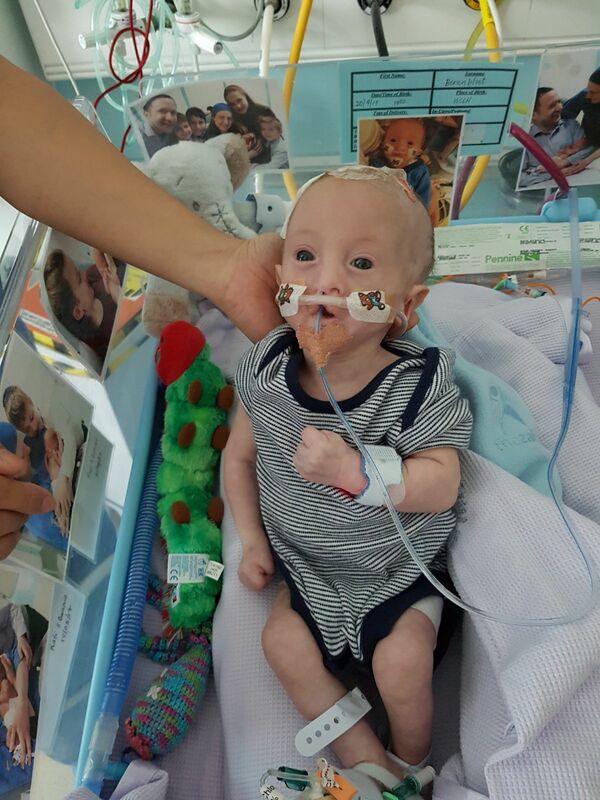 His given name Donnie reminds us of the outstanding care we received at UCH led by Professor Donald Peebles. In the meantime, the staff are calling him DK and it has stuck for now. We have some very difficult decisions to make in the hours and days ahead. As always, we thank you for being there. 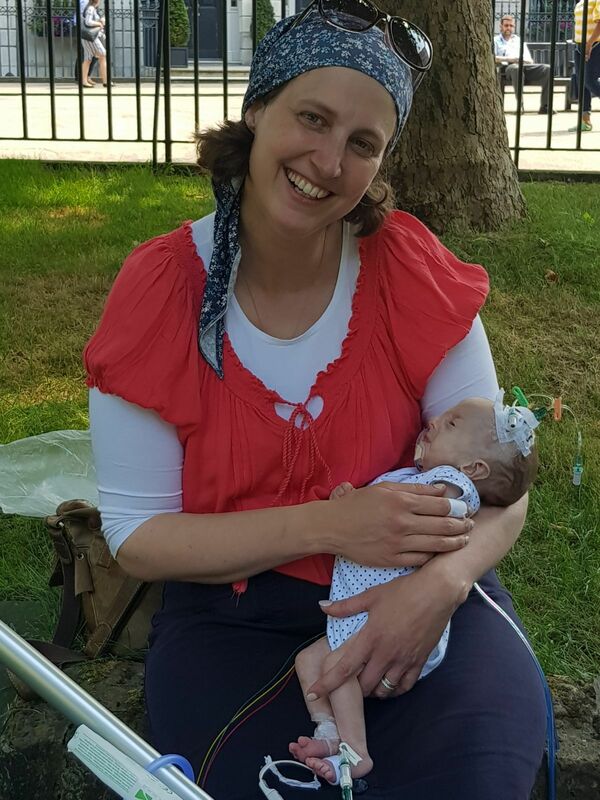 Just a quick update to let you know that yesterday I met with a neonatal consultant from our local hospital and Donnie's attending consultant from UCH to discuss a possible move to our local hospital. As a result of this meeting, it has been decided that Donnie will stay at UCH (for now). 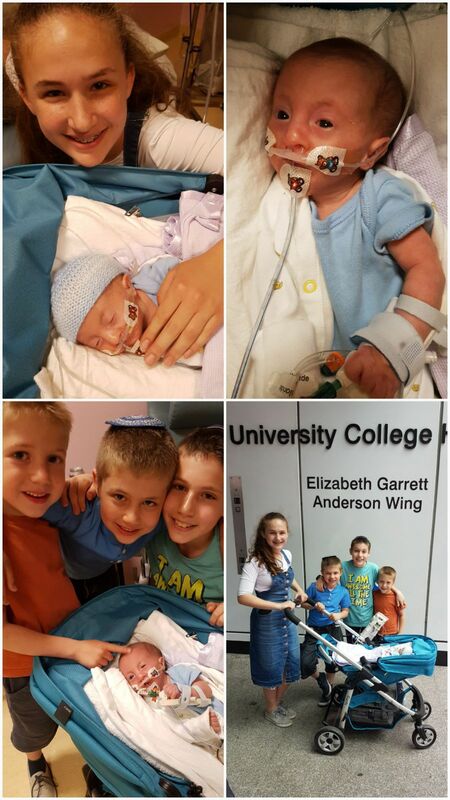 We agree that UCH is the best place for him and are grateful to the hospital for looking after him so well. Thinking about the bar mitzvah, we are going to try and focus on getting the house in shape to receive guests this week post building work. Lots of people have kindly offered to help as and when needed. If anyone is around today and fancies helping me clear and organise, do pop in! Would love to see a friendly face too. I will probably be here this morning and early afternoon! 1. 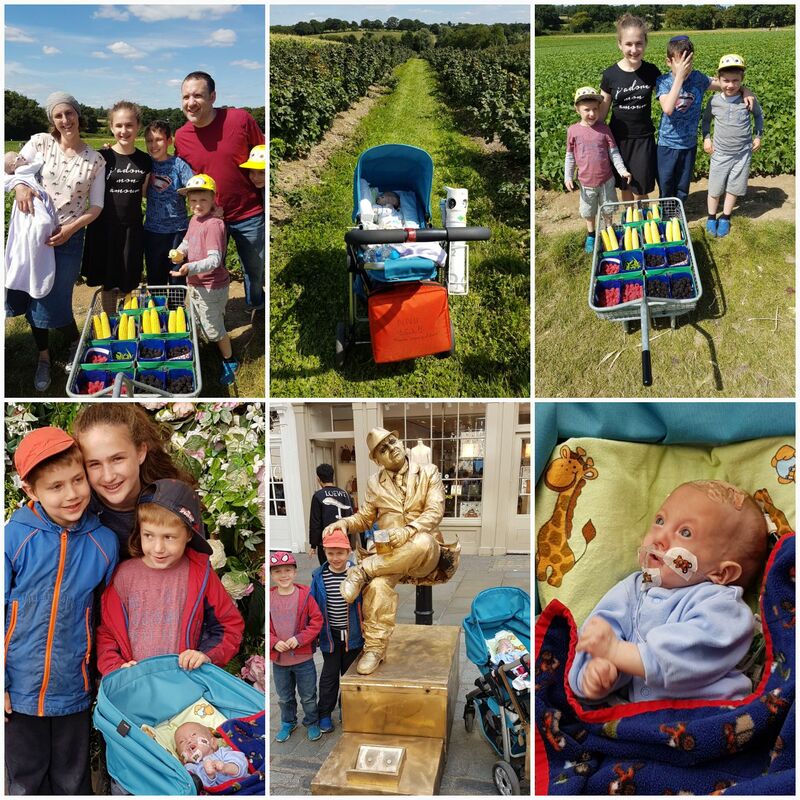 A trip in a pram out of the ward where Donnie has lived since birth, made possible largely due to the infectious enthusiasm of one special nurse. We didn't make it outside on this occasion but we did make it as far as a view of blue skies, trees and red buses (with the help of two nurses and a trail of medical equipment). This nurse tells us to dream big! So, together with Donnie's current medical team, we are planning a family picnic next week in a nearby park... In the meantime, we are enjoying this moment. 2. Away from the hospital, we took time to fit in my first visit to a polling station as a British citizen. 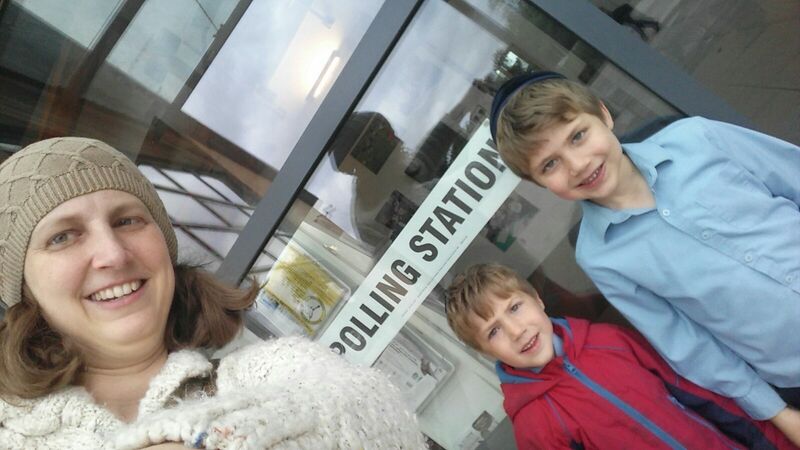 I took the boys to see me vote and they know my vote made a difference. Special moments and pics to follow. Donnie is 8 weeks old today and we couldn't have asked for a more meaningful way to celebrate. 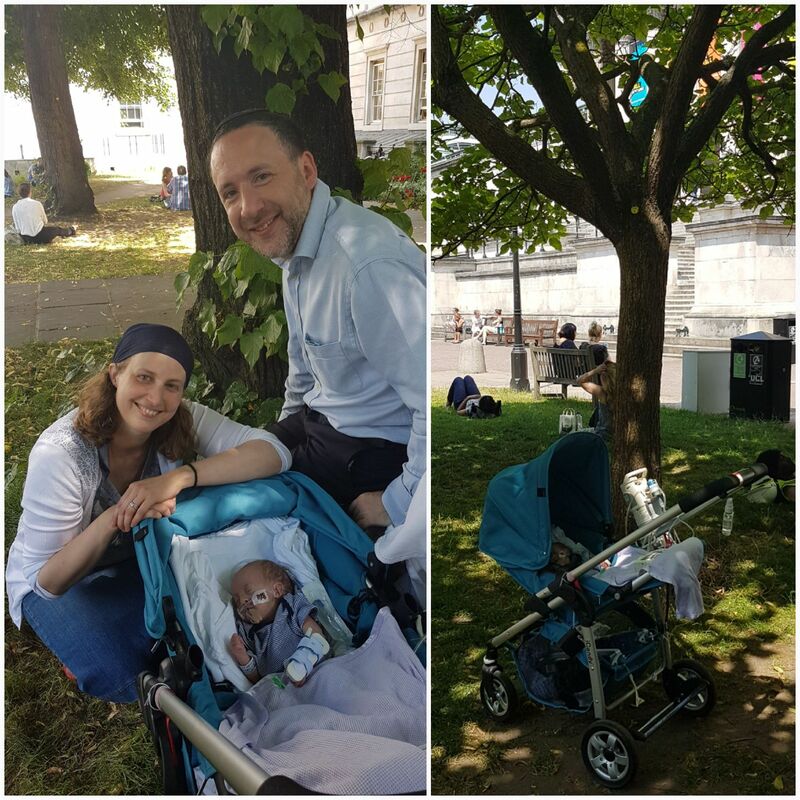 We are so very grateful to Donnie's current attending consultant and special nurse for taking the idea of a walk outside and a family picnic under a tree from the realm of the possible to the realm of the actual. And we recognise that behind them in the NNU is a whole team of people who played a part in making this happen. We should emphasise this does not change Donnie's prognosis and he is no closer to coming home. But this is about him feeling the sun on his face and the wind in his hair. And about us enjoying his life with him and creating memories. And about his medical team making this possible. Love to you all and enjoy the pics. So... another week and another picnic! Donnie is two months old today and stable and the weather forecast is good so this week's lovely attending consultant is happy to come out with us. This time, we are inviting you – our friends – to join us to celebrate Donnie being here. If you could / would like to join us in the Euston area around 12.30-1.30pm tomorrow Wednesday 21st June, please lmk. Precise location tbc but will be somewhere with grass, trees and blue sky. Sitting in the NNU this week, I wondered how we could possibly top the picnic we’d already had? There were so many firsts and it was such a meaningful experience. 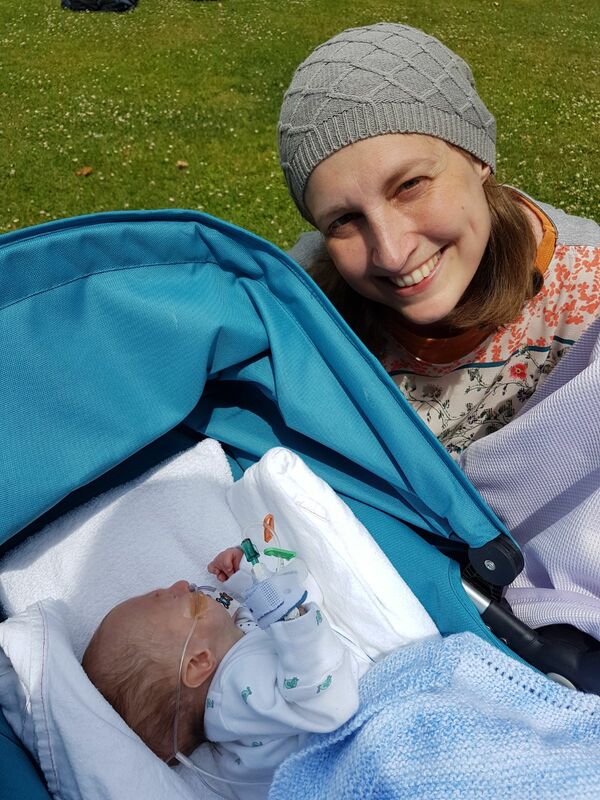 Today, I took Donnie out of the neonatal unit where he lives. 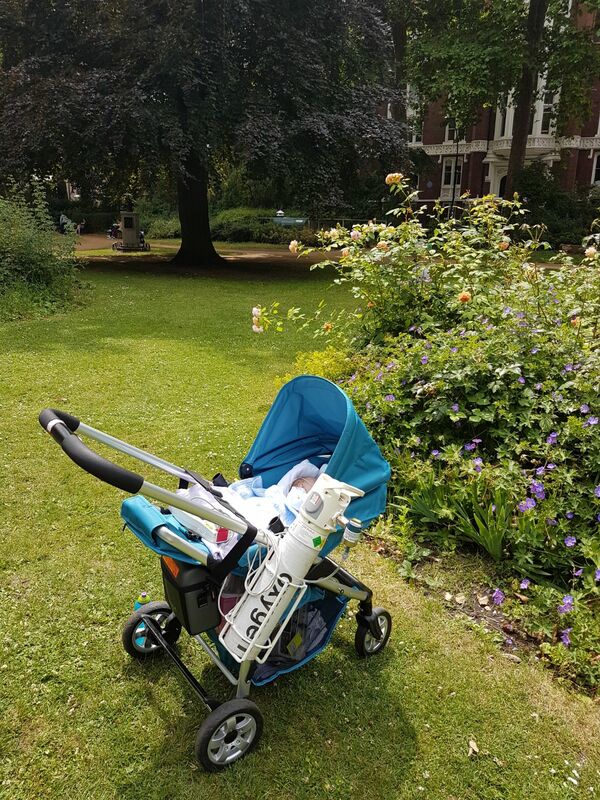 We went for a walk to a local park and we enjoyed quality time together in the sun - just the two of us. Plus a very close friend. No attending doctors or nurses. And the plan is to do this again. And again. For as long as Donnie's health allows. This will be good for Donnie and good for us. Today was the culmination of three weeks testing / reducing Donnie's reliance on his oxygen flow, during which I had a crazy idea which turned out to be not that crazy. If Donnie can cope with little or no oxygen for a fixed amount of time, he becomes more portable. And normal things like a daily walk outside without an entourage or a Sunday family picnic - just with family - become possible. 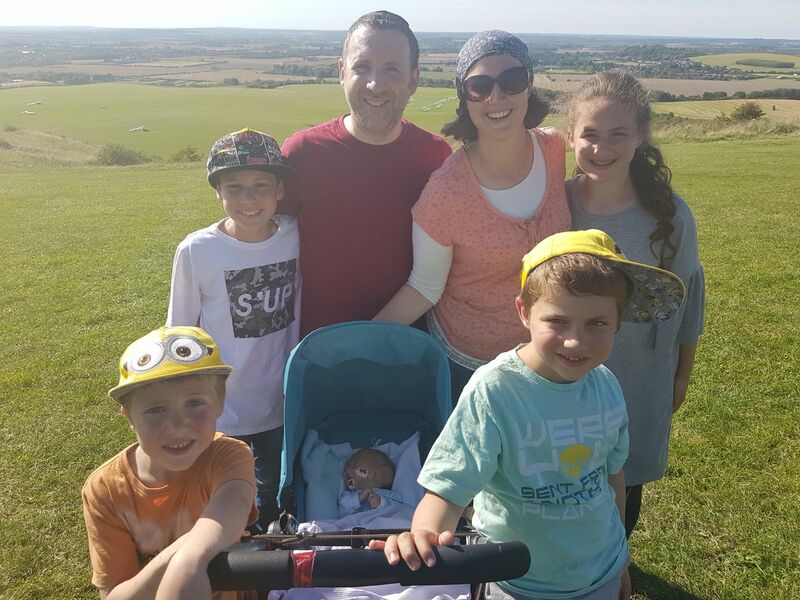 And where better to start than with a family picnic on Sunday to celebrate Rafi turning 8? 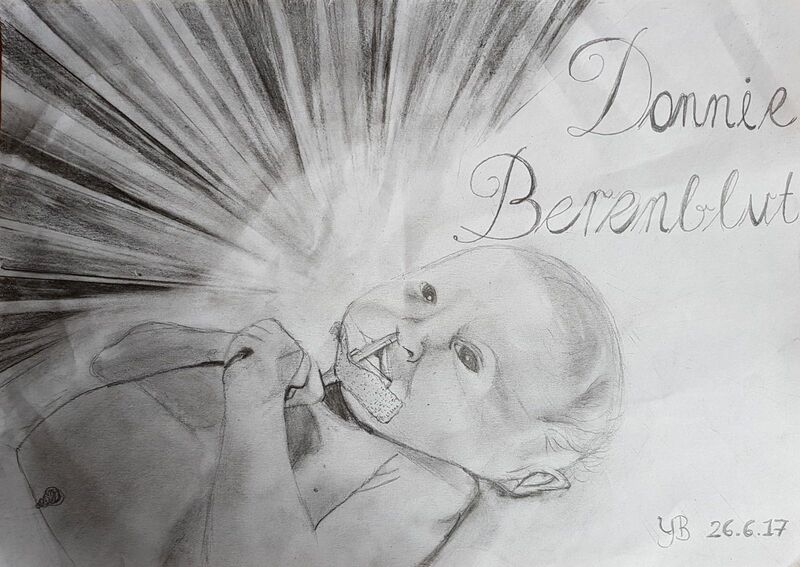 PS This week’s pics – Donnie as drawn by Yael, Donnie in a restful sleep during one of his trials “in air” and Donnie today. After more than a month in a room with no natural light, Donnie is now in a room with windows. Everything feels better and we are very thankful to the consultant who helped because she knew it would be good for us. And in that room, Donnie sleeps on colourful sheets - brought in by a senior nurse who slept on those sheets when she was a baby to brighten up Donnie's cot whilst he is on the unit. We can't believe the kindness. And every day this week, Donnie has been out - sometimes for several hours - including to celebrate Rafi's 8th birthday. 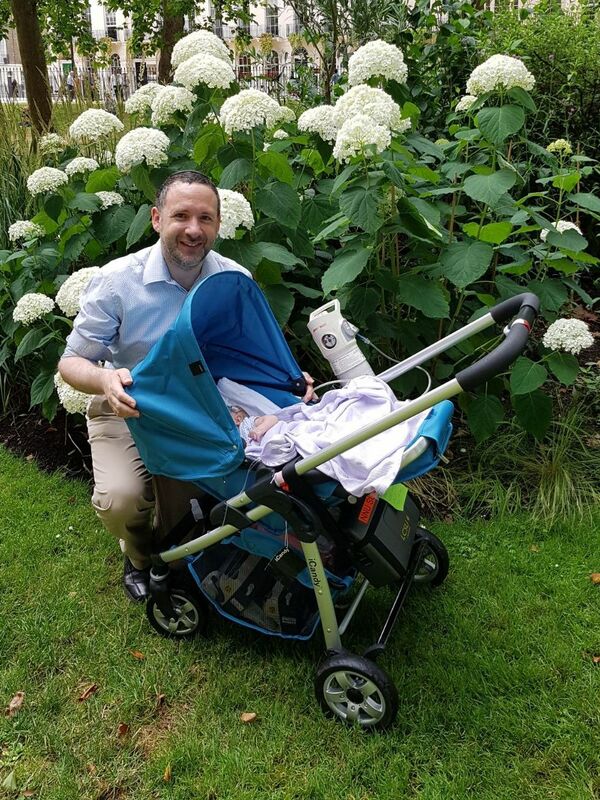 He has been to Sainsbury’s and Waterstones and tells us that his favourite park is Fitzroy Square where he has spent lots of sunny hours settled on little or no oxygen. So life for Donnie has been good this week and we have enjoyed it with him. In the background, things feel quite uncertain. Donnie is the proud owner of a new piece of headwear and looks like he can receive the BBC World Service through his head. This is because his scalp was the only place where doctors could find a vein to insert the cannula he needs for his medication. Realistically, it is also just a matter of time before Donnie loses the long line which has fed him for 6 weeks and it will probably not be easy to insert a new one. 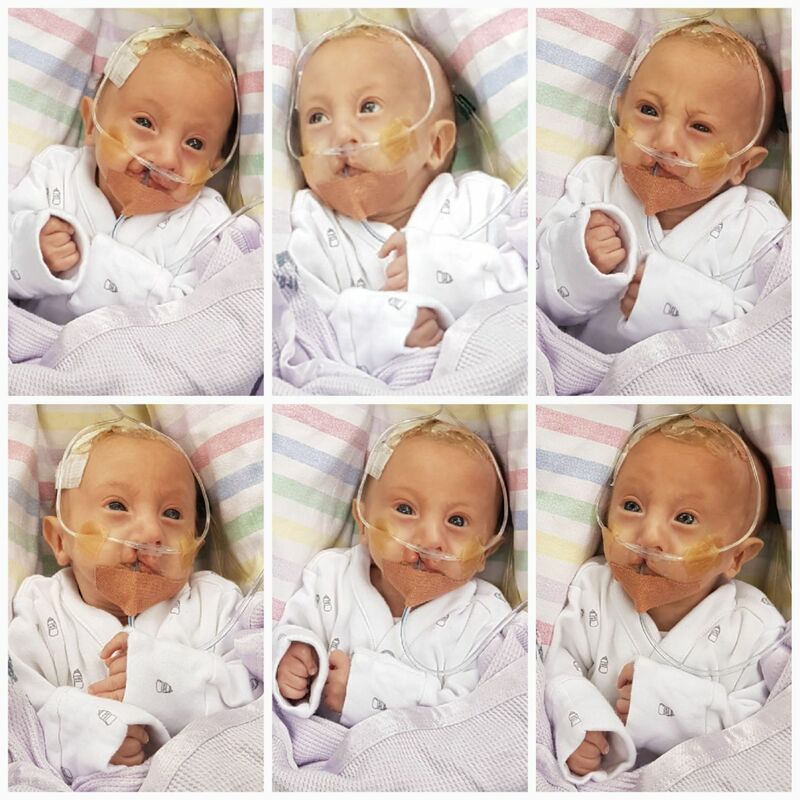 Next week, a multi-disciplinary meeting (MDT) will consider a range of ideas for Donnie moving forward (and will try to create a protocol for babies like him). We do not know what, if anything, will come out of the meeting but we are very grateful that the meeting is taking place. It means that Donnie has people around him who continue to think of him and reconsider what is possible. This week’s message is hard to write. Because in some ways nothing has changed and in some ways a lot has changed. On Saturday, Donnie lost the long line which was feeding him. On Sunday, he got a new one, which is working well so far. So no change there despite a few hours of uncertainty. 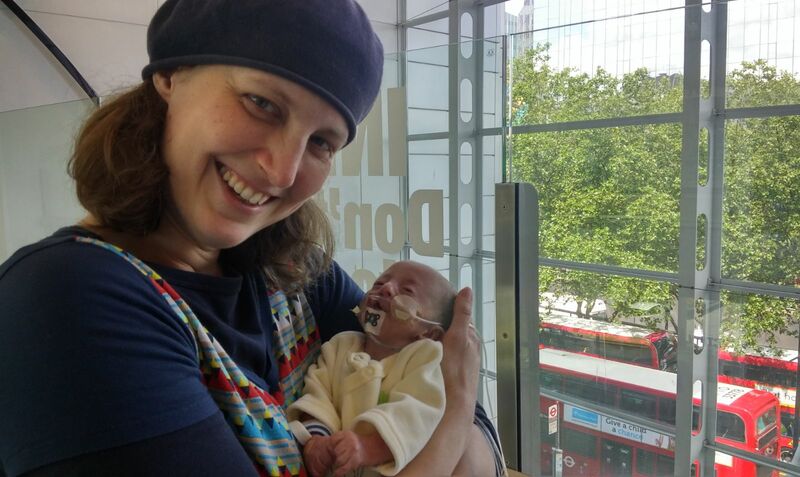 And on Tuesday, an MDT met at GOSH. 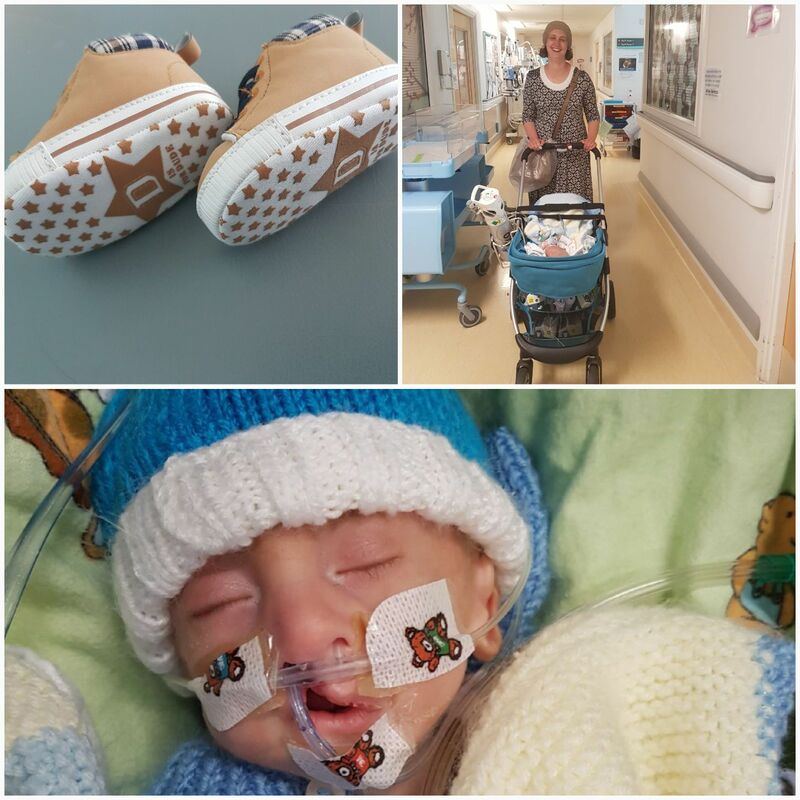 For two hours, more than 10 specialist doctors representing surgery, anaesthesia, cardiology, radiology, paediatric intensive care, neonatal intensive care and palliative care discussed options for Donnie. Sadly, though not surprisingly, their resulting opinion was that there are no interventions which have a realistic chance of making Donnie’s life longer or better. So, for now, his current treatment plan continues. And again, nothing has really changed. At the same time, a lot has changed. Our impetus to get Donnie out and about has increased because one day, probably not too long from now, it is likely that feeding options for Donnie will run out. 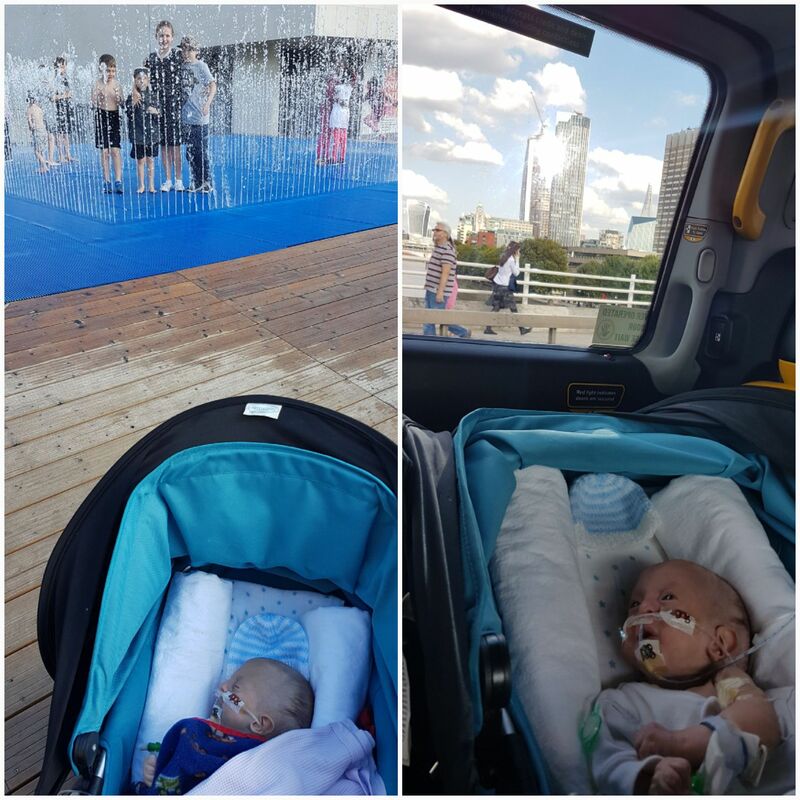 With support of the doctors looking after him, we are planning for our daily trips out of the unit to become longer and take us further afield once the holidays start so that we can enjoy London together for as long and as far as Donnie allows. 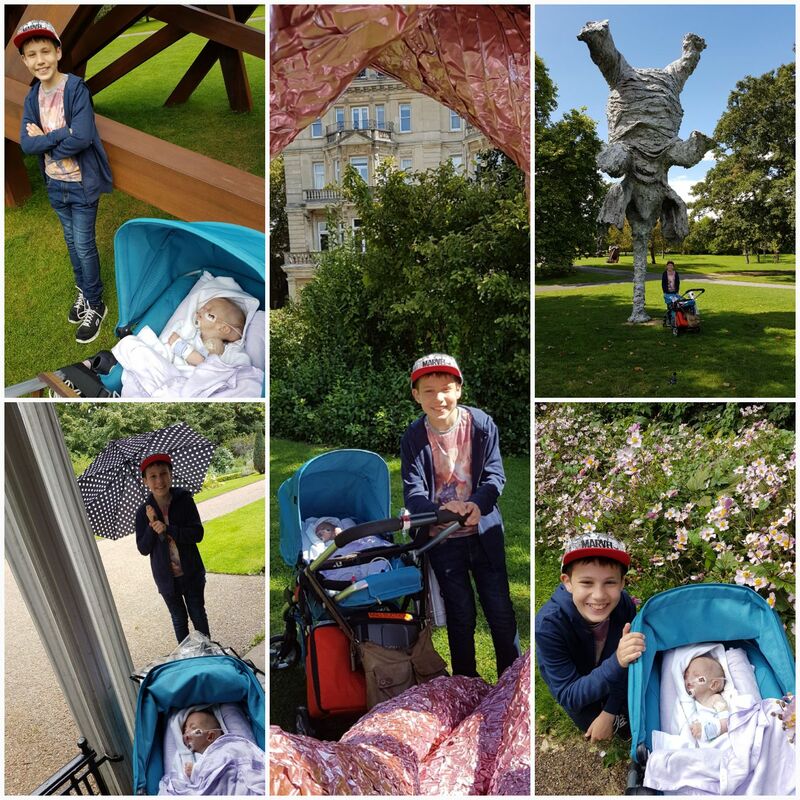 And Donnie's adventures started today... With the help of a special friend, we went to a beautiful part of Regents Park - the furthest we've ever been and a lovely way to end a long week. Thanks as always for all the messages, good thoughts and visits. It makes all the difference. 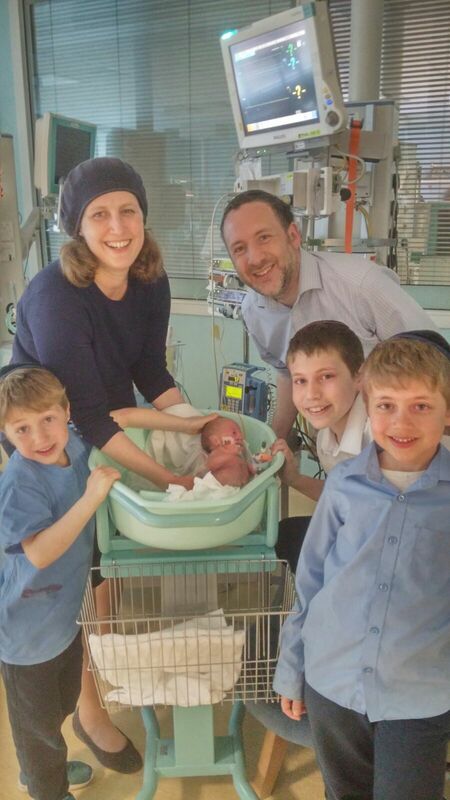 PS Mazal tov to Mara and Mike on the birth of their gorgeous son who was born just metres from where Donnie lives. Donnie was three months old this week! 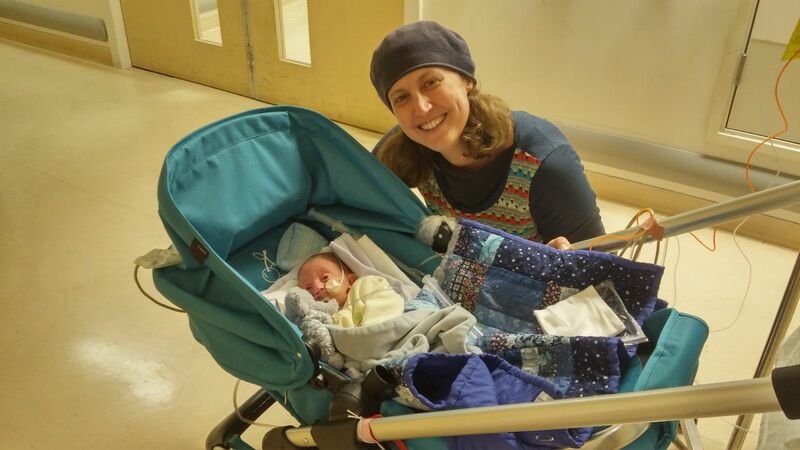 In those three months, he has been loved by his family and cared for by his doctors and nurses; and he has taught us all things along the way. More recently, he has experienced the sounds and sensations of the big wide world. Sadly, this week has been difficult for him (and for us). 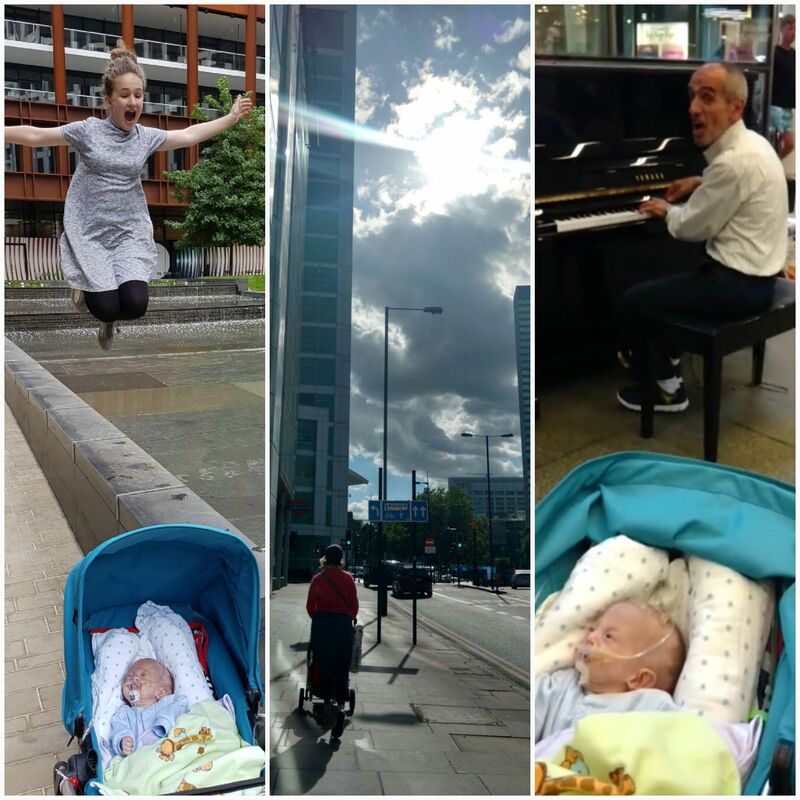 A chest infection early in the week made him work hard to breathe and was followed by repeated apnoeas on Wednesday (which led to profound desaturations) and Thursday (31 in 5.5 hours). Over two days, it seemed Donnie's heart was tired and this was his final decline. But since yesterday afternoon things have settled and it could be that the apnoeas were related to his infection and not to a final decline. The uncertainty is challenging for all of us - to compartmentalise, to adapt and to keep enjoying precious moments. On Thursday, Yael was recognised for doing all of these when she was named Student of the Term. Her head of year explained that "in the face of everything, she has always managed to smile and be kind to others and staff and she has conquered the challenges of the GCSE’s, the coursework demands and I am incredibly proud of her and the woman she is becoming". 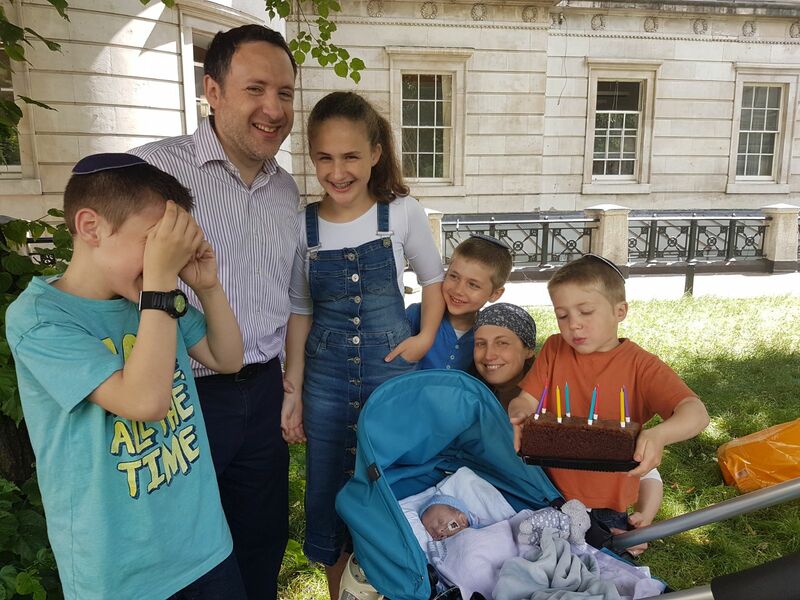 And Matty won £40 in a challenging Gemara competition at school, which he entered and worked for without telling us. We are in awe of them both and have renewed hope that the experience of having Donnie in their lives will just become a part of their new more resilient, adaptable and independent selves. 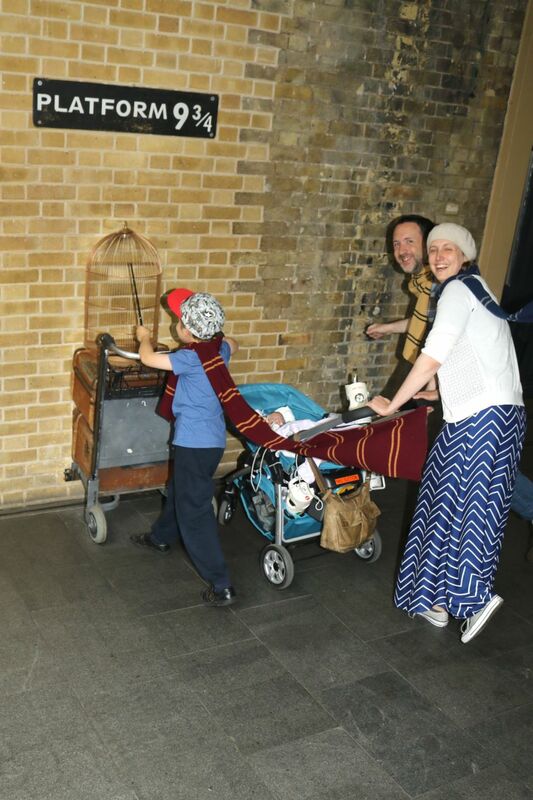 Taking inspiration from them, we took Donnie to platform 9 3/4 and Granary Square today. It was day one of the holidays for Rafi and he deserved a treat. Donnie enjoyed his outing too. So much kindness for Donnie and us in the last seven days on the NNU. And off it too - help with children and food, visits and messages. And we cannot help but reflect on the last week in the context of what came before. Exactly one week ago we thought Donnie had just hours to live. All this would have been missed. 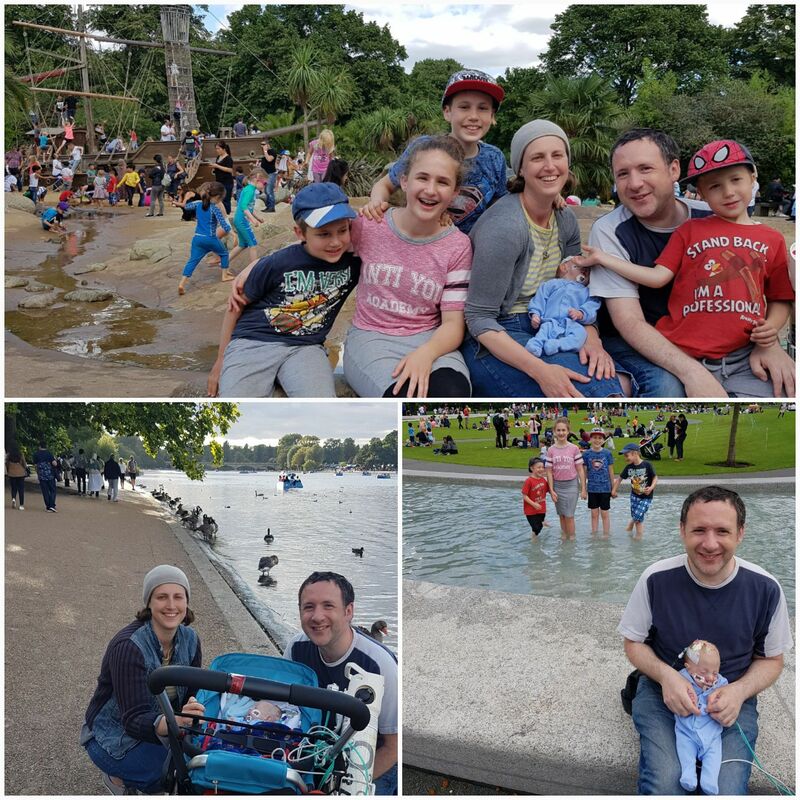 So too would some lovely moments away from the NNU for Donnie and us including a lovely sunny afternoon in our new favourite part of Regents Park and a visit to London Zoo. On Sunday, we had no plans for this first week of the holidays and nothing was booked. No camps. No play dates. No organised day trips. Just a feeling that I wanted to keep everyone close. And enjoy the fact that we were not tied to a schedule – which makes living in the moment a whole lot easier. Thankfully, Donnie has had a settled week so we have too. Last week was not a good week for Donnie or us. I tried numerous times to put together an update to explain but I just couldn't find the words. It turns out that some things are simply too difficult and too complicated to be adequately explained in a limited number of characters. But yesterday was perfect. Donnie came fruit picking. He was comfortable, the blackberries were ripe, the sun was shining and we were joined by lovely friends. And before we went, the on call consultant asked to speak to us. She gently explained that Donnie was not at his best, that she thought it would be good for him to be out but she wanted us to be comfortable... and with that simple conversation she reminded us of all the good and she pretty well summed up where we are right now. Donnie is not at his best. He is being fed thanks to the (new) long line which hugely skilled doctors unexpectedly managed to insert and keep last week. But the line is fragile. And it is providing less nutrition than it ideally should. Donnie is also fighting an infection (probably of the long line). But it will take a lot to stop him coming out. 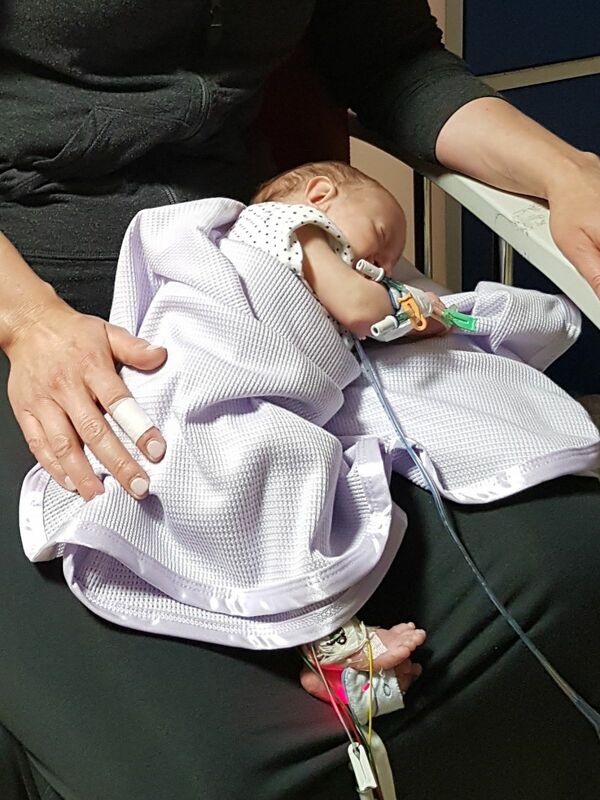 A meeting last week agreed this - whether he is still being fed, is on fluids because feeding is no longer possible or only on oxygen and opiates because other options have run out. And we accept that on one of our outings, Donnie's weak and fundamentally flawed heart may give up. Or he may have an apnoea from which he doesn’t recover. Or a chest-related event. One of these will inevitably happen one day soon. 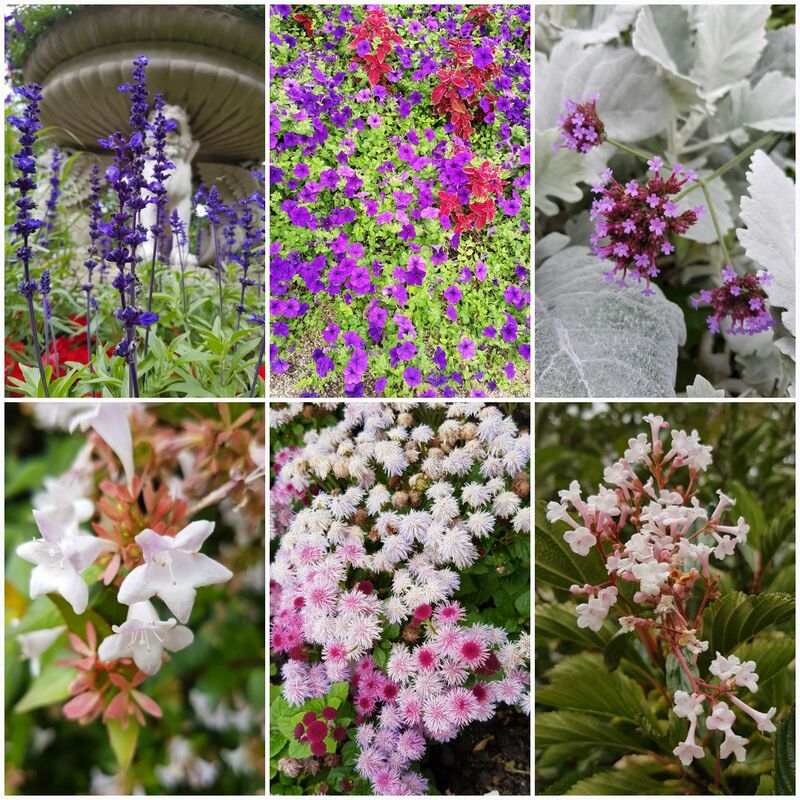 But no-one can tell us when so we continue to enjoy the summer in London with Donnie in Regents Park, Hyde Park (twice), Covent Garden and the South Bank. 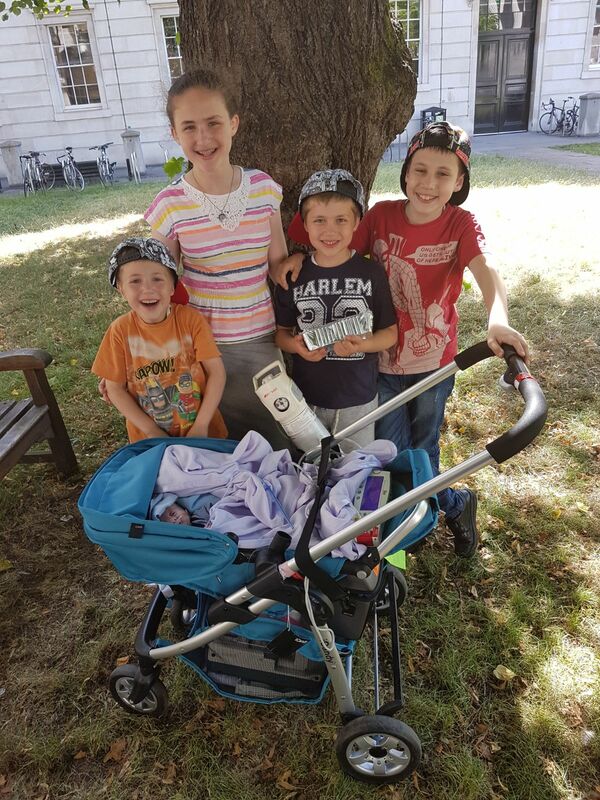 And along the way all 4 kids have agreed that Batman boots (as worn by one of Donnie's consultants) are cool, remembered my dad as staff modified coat hangers to create a mobile for Donnie and seen again how special London cabbies are. Donnie has been really well. He seems to have overcome his infection and his longline has continued to feed him. And we have been lucky with the weather as the rain has (mostly) held off and it has been warm - which is good for Donnie as the location of his current longline means he is often sporting an off the shoulder look. The big kids have each had a day out with me and Donnie - the little boys had had one already - and on the other days we've been joined by whoever is around when we have gone out. Donnie is generally very settled on our outings. 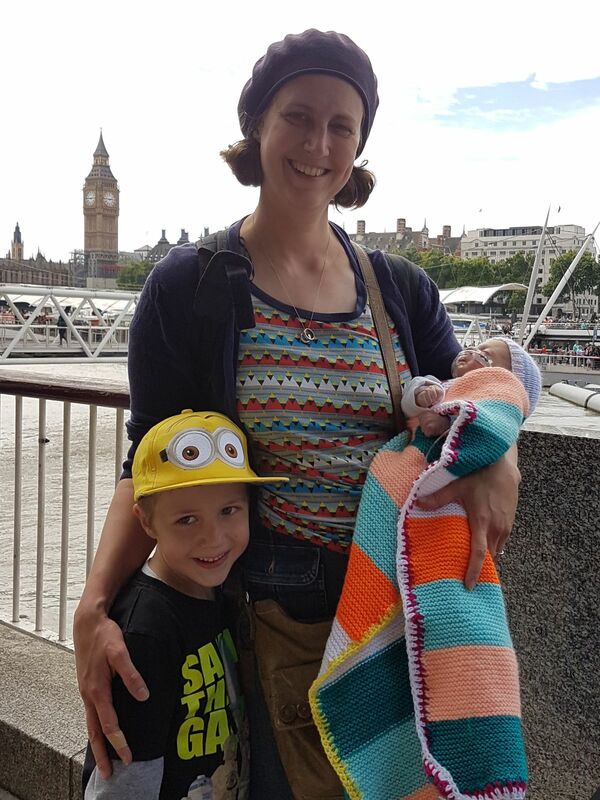 He sleeps a lot - often settled by motion which changes according to our journey and this week included the sensation of cobbled streets, grassy hills and the River Thames. And when he is awake, we have seen Donnie watch the changing colours and movement of leaves overhead in the breeze. And focus on passing sounds such as flowing water, rain showers, thunder and dogs barking. 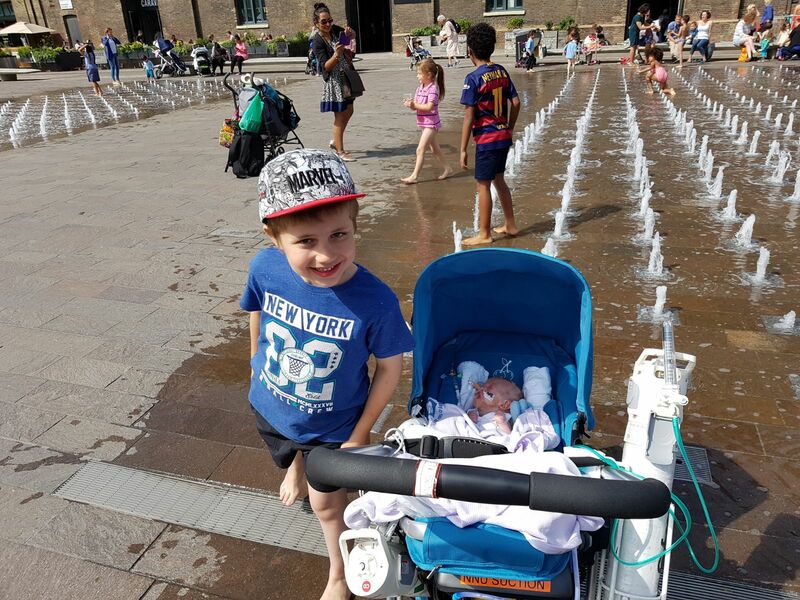 As a baby who is nearly 4 months old and is therefore now more of a paediatric patient than a neonatal one, these experiences are increasingly important and, as ever, we are very grateful that he lives in a place which enables this. 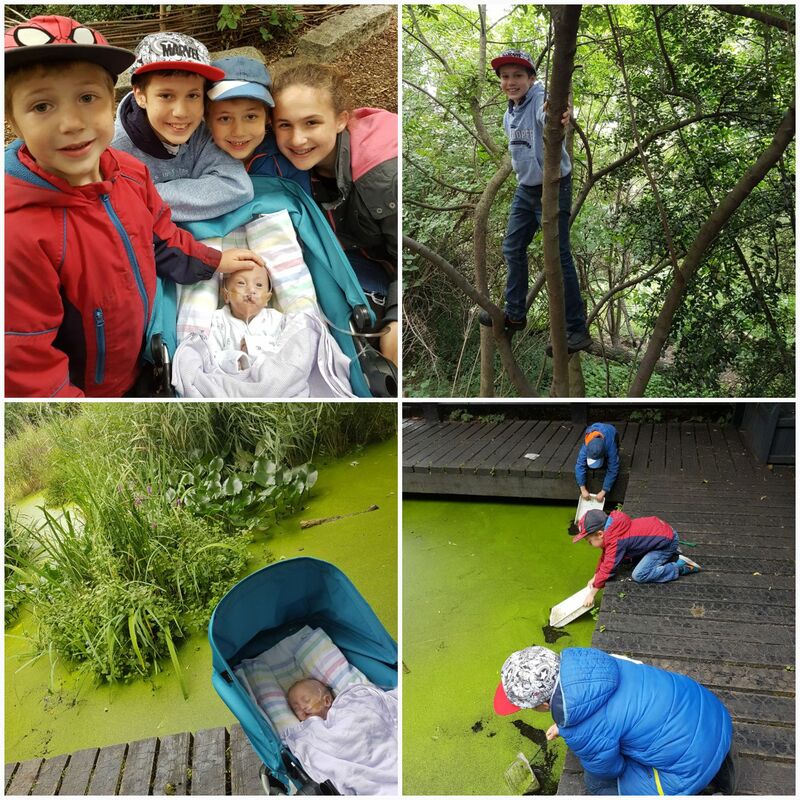 That Donnie can be surrounded in these experiences by his siblings is of course a massive bonus - for them, a day out without Donnie this Summer just isn't the same. Pics as always to follow. Week 5 of the holidays - just one to go. Donnie has been settled and is (again) in the best possible hands. 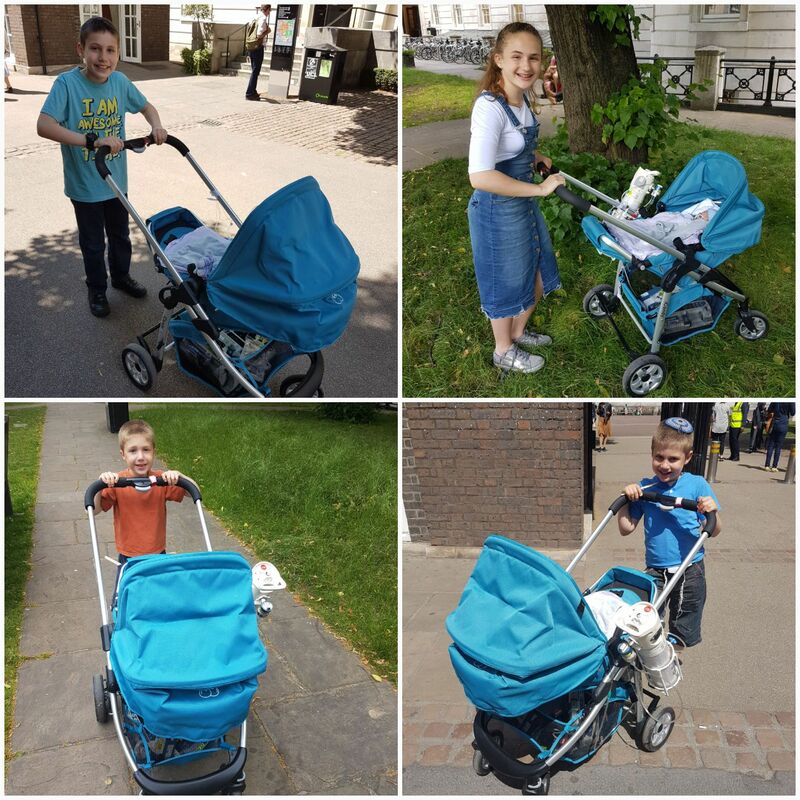 We have visited Regents Park (again), Hyde Park (again), Trafalgar Square and London Zoo (again). Is it obvious that we are running out of new things to do which are: within a short radius of NW1 (say 20 mins by black cab); wheelchair friendly (we carry an oxygen tank and are laden with equipment); not too pricey (we need things for each day); where occasional bleeping does not offend (no shows); no human remains (that one alone takes out all the best museums ☹) and ideally mostly outdoors (because that's what we crave)?!? And also par for the course by this point - and exaggerated by having a second home in a hospital ward - I am tired and craving some me time. But I know that one way or another I will have plenty soon. For now, we have up to 9 days left of lingering in London with Donnie before school starts and that is a lifetime for Donnie. And lingering as described by Melanie Reid in a recent article can be a good thing - if we can ignore the bickering to notice things, daydream, think and talk. Which is good because we linger a lot these days. It often takes us longer to get out of the unit with Donnie than we hoped. And when we are out we need to stop much more. So small trips last longer and we cover less ground on big trips. And we walk a lot because it is often easier and always cheaper to walk across London than to hire a taxi (and buses and tubes are out of bounds for infection control reasons). Our record was a walk back to Euston from Hyde Park using the BT Tower as a beacon! Enjoy the bank holiday - just one pic this week because it makes my heart melt. Apologies for going off topic but Yael receives these messages and she deserves a special mention this week because we are very proud. 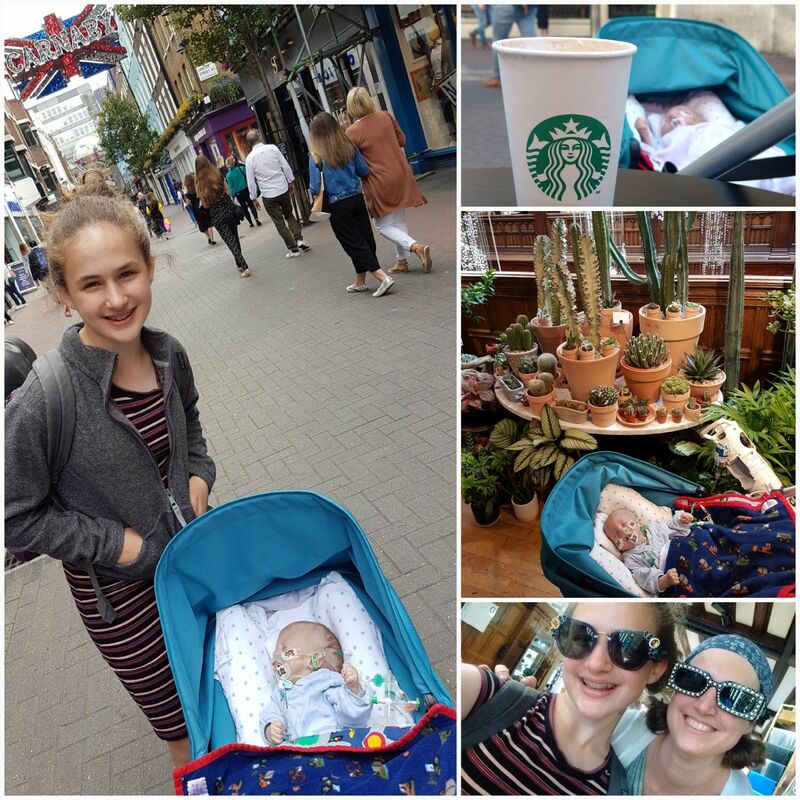 In the face of the most exceptional of circumstances, she has acquired two GCSEs this summer a year ahead of time. And the credit is all hers. She recognised the challenge of coping with uncertainty, visiting her brother after school and juggling her work. She identified people who could help and sought their advice - notably the ever supportive headteacher and senior leadership team at her school and she worked independently to a schedule she devised. The achievement is entirely hers. And we don't mean the grades. She has found incredible strength of character, focus and determination. And she has continued to smile throughout. And we couldn't be prouder of these achievements which will surely prove as important as the grades she achieved. 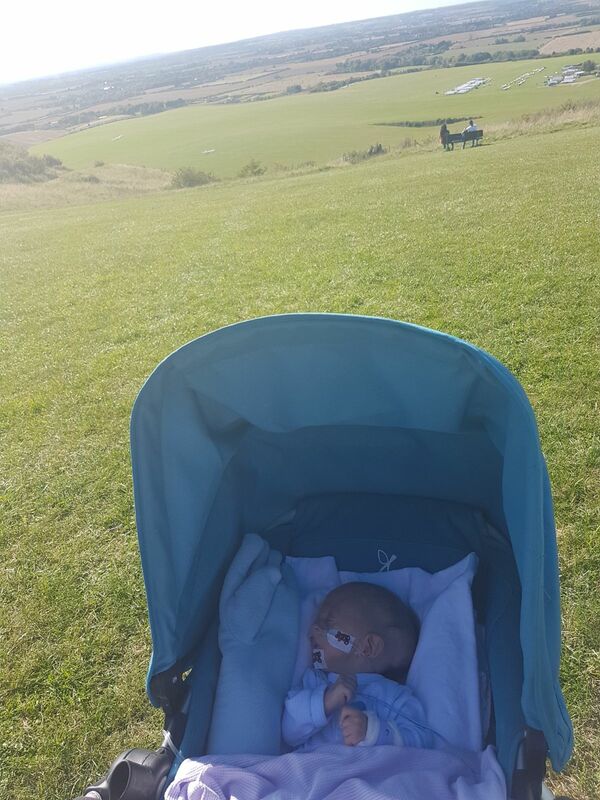 On Sunday, we took Donnie to Dunstable Downs-our favourite bit of countryside. It was a beautiful day and a couple of pics are attached. Unfortunately, since then, the long line which was feeding Donnie has stopped working and, despite several attempts by doctors, it has not been possible to replace it. This means that for now Donnie is not being fed. Whilst there is still a chance that doctors will be able to insert a new line and they have committed to looking for this, the odds are not in Donnie’s favour. This is obviously a sad day for us but not an unexpected one. And it makes all the difference to know we are surrounded on the unit by people who care deeply about Donnie and will do everything they can for him. For now, Donnie is hydrated and receiving medication through a cannula. He is not in pain - his doctors will not allow that. Whilst it has been strengthening to receive all your messages to this point, we feel the time has come for us to focus on things here. We will try to text if there are significant developments so if you don’t hear from us, please do not assume the worst. And we know some of you will ask how you can help. If anyone has a Rafi or Ami shaped hole they are looking to fill over the next few days, before or after school restarts, that will be the biggest help as the two of us will need to focus on things at the hospital. In the meantime, thanks as always for your support, good thoughts and prayers. I start with that so you do not skim read this message for something else. And because, I am reminding myself. On Friday, Donnie's attending consultant examined him to see if another longline was possible but it isn't. He has done a lot to make Donnie's life good and came to a considered decision. We couldn't have asked for more but Donnie will not be fed again. And on Thursday, a meeting agreed a way forward when cannula access ends so Donnie can be free of pain in his last days even if he cannot be hydrated. And within hours, the unit had stocked up on resources and trained staff, which is of course good for Donnie. But I let it get to me - because watching as Donnie stops being fed and hydrated was always the scenario we feared the most - even though clinically not much has changed yet for Donnie since Tuesday. He is still hydrated and not in pain and alert when awake – he's just thinner and a bit less able to control his temperature. 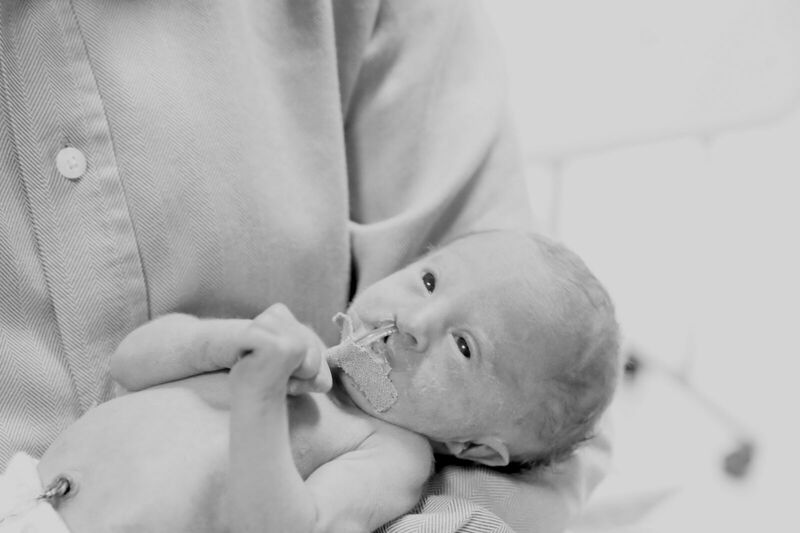 And a baby can live on fluids alone for a few weeks and for a week or so without food or hydration. So Donnie still has some living to do and enabling Donnie to live as part of our family has been my mission since it was first suggested he gets off the unit. And I must use every resource l have to focus on that as it becomes increasingly hard. Yael, Matty, Donnie and I went shopping on Thursday and bought clothes, a blanket and a pair of “D is for dude” shoes. He is a 5th child but even 5th children deserve their own things occasionally. And on Friday, I gave Donnie cuddles, a walk and a bath - his favourites. And we will continue to do so for as long as we can, knowing that Donnie’s attending consultant for the next two weeks will look after him medically, with respect and with deep kindness for however long he is under her care. The worst of moments is close at hand and there is no-one we would rather have beside us at this time. On Sunday, Donnie came home. 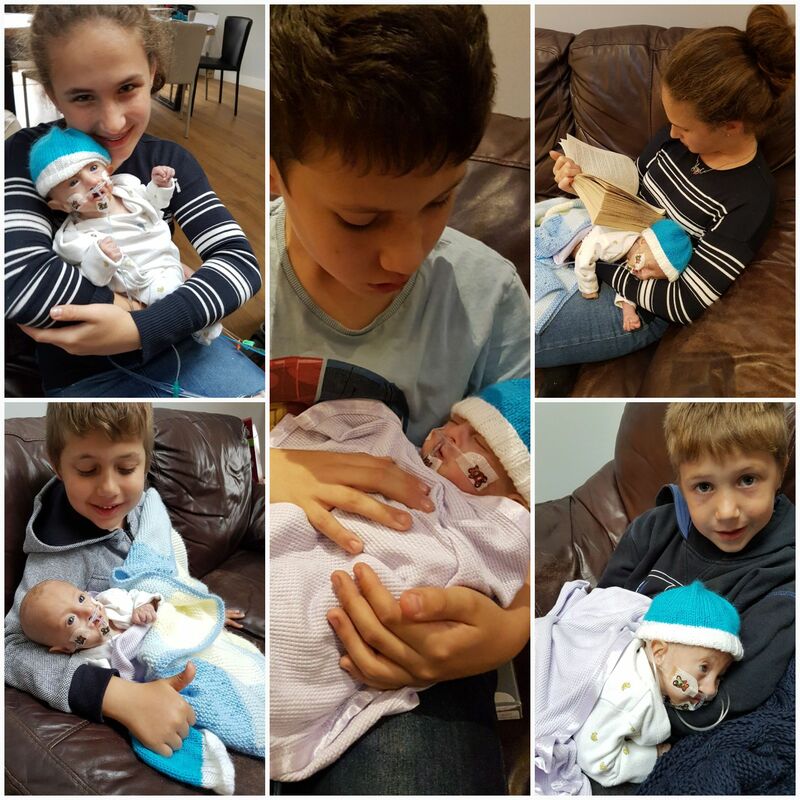 He enjoyed cuddles with his sister and brothers and was alert. 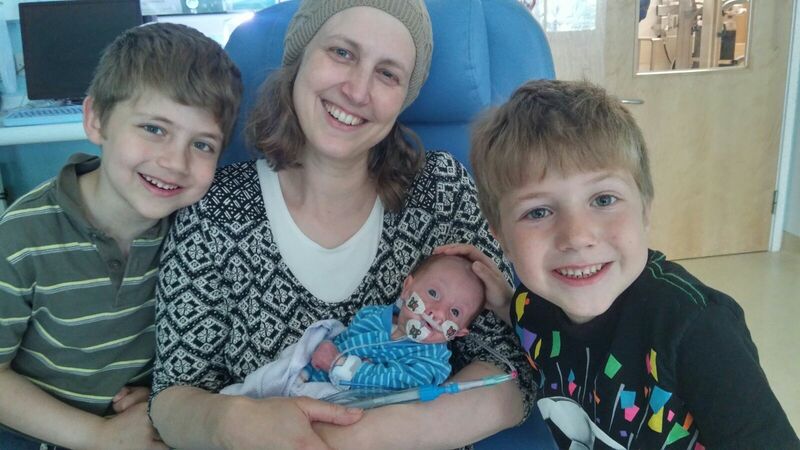 And on Tuesday, Carol, Clare and the kids popped in to the hospital for a cuddle. But on Monday, the cannula which was hydrating Donnie stopped working and despite the best efforts of Donnie's doctors it was not possible to replace it. So Donnie is now receiving pain relief (only) subcutaneously. He is settled and pain-free and I am sleeping in the hospital and one of us is with him round the clock. I have always had a strong belief that I could deal with anything which came my way. Not because I am strong but because I am pragmatic. And for 136 days that was more or less true. So I was right and I was the right mother for Donnie. But that time is over and this week Donnie has needed me to be immersed in the present - to be still and to hold him close and I have done that for many hours day and night. But my challenge is to be kind, to stroke him and talk to him when I am tired and numb and weakened by watching his decline even though I know that he is unaware of it. And not to be hard on myself if I can't. It is hard to keep giving when your head is exploding with the uncertainty of waiting for something but not knowing for what or when. But Marcel is good at living in the moment so he will carry some of the burden now. And we will let you all know when there is something to report. In the meantime, thanks as always for everything. We are very sorry to let you know that Donnie passed away a short time ago this morning. 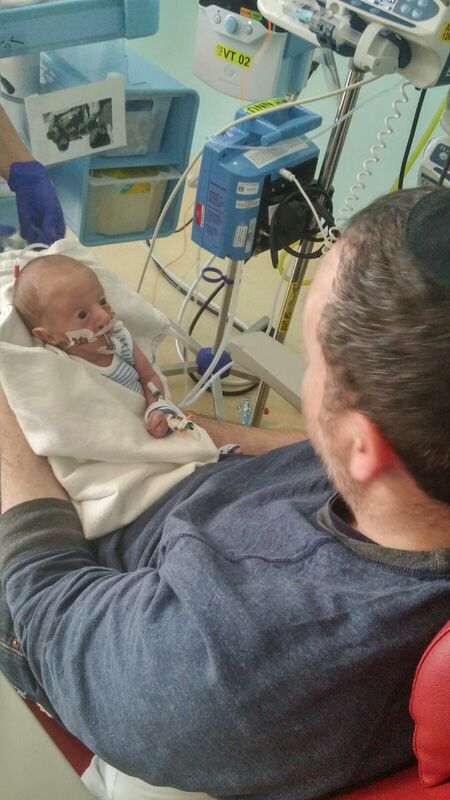 The funeral (levaya) will be today or Sunday. We will let you know. Please have him in your thoughts and prayers. This is the first update since Donnie died. It seems weird to start without numbering the week but it would be weirder to continue counting. Donnie lived one more night after our last update. And as you have followed the journey of the rest of his life through our updates, we felt we should finish with an update on this too. 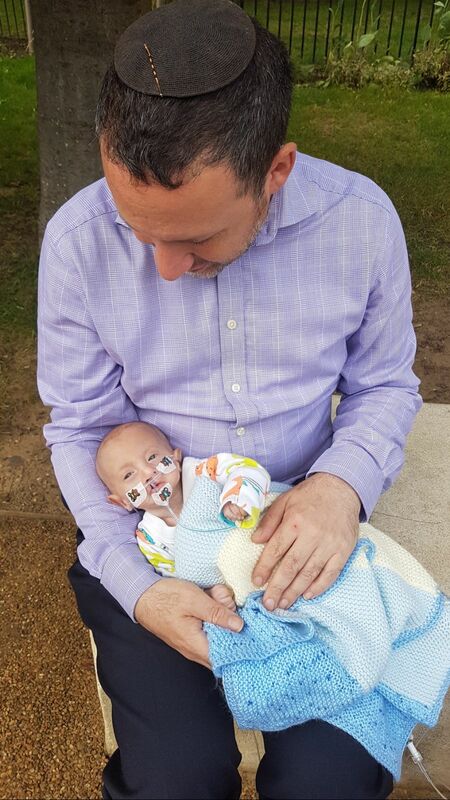 On Thursday afternoon, we went for a walk in Regents Park, during which Donnie’s breathing was shallow but settled. It was the first time, Marcel, Donnie and I had gone for a walk on our own. And it was a lovely relaxing walk. It was from there that I sent the last update. 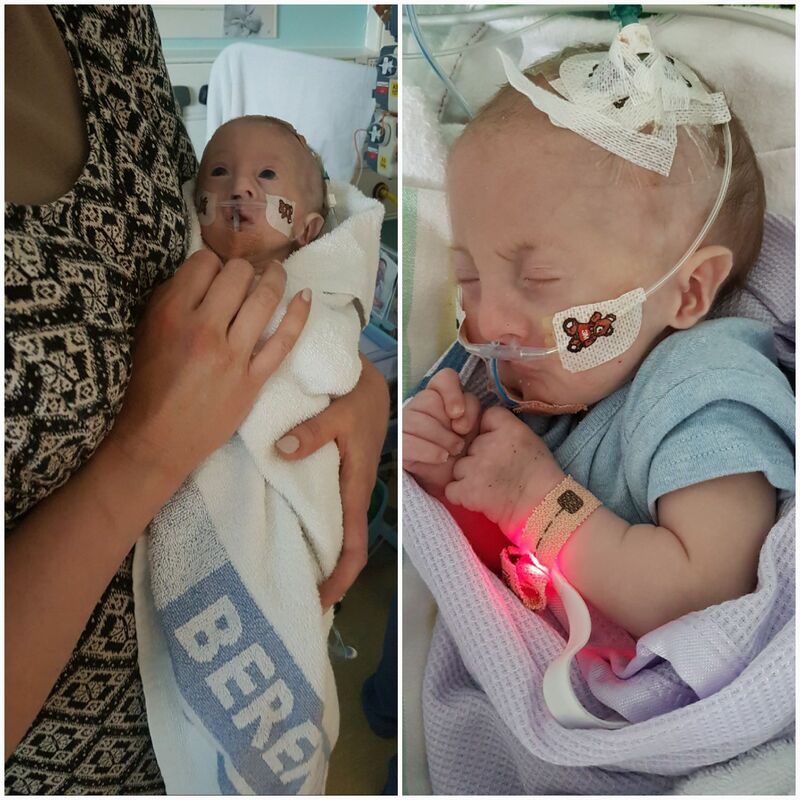 We decided that on our return we would not take him back to his cot in the neonatal unit, where he had slept every other night. Rather, we would take him to our room where we would take turns to hold him and rest. We had no idea that anything would change – it was a gut instinct that we wanted him close and away from the busyness of the unit. Donnie waited till we had eaten dinner and almost immediately his breathing started to change, his apnoea alarm sounded repeatedly and he started to gasp. We called the on-call consultant who feared the worst and went to fetch her stethoscope; and we called the kids to come in and say goodbye, warning them it may be too late. But by the time the consultant returned, Donnie was awake and looking around like there was nothing wrong. We laughed with her at the fact that Donnie had "donnied" his doctors yet again and when the children arrived to find Donnie settled and sleeping, they said their goodbyes and left us. It was a long but peaceful night. 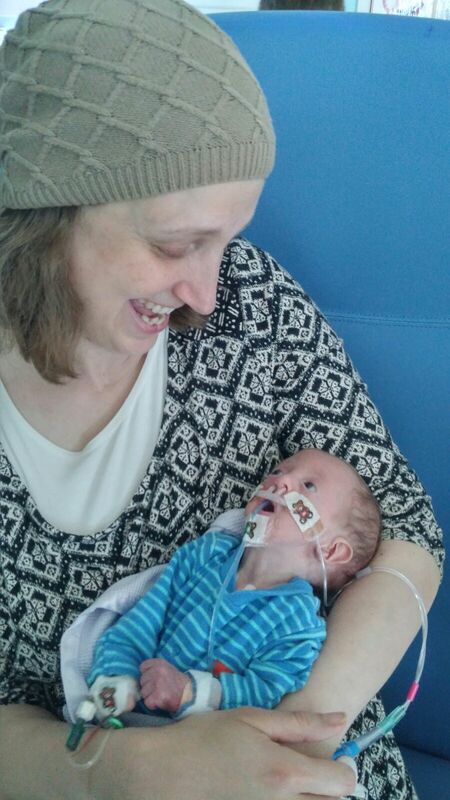 We took turns to hold Donnie and rest and we were supported by two lovely nurses and the on-call consultant. They gave us space but checked on us regularly - a difficult balance they got just right. As the night progressed, the spells of apnoea grew longer and the gaps between the spells grew shorter. At times, it looked like the end was close but repeatedly Donnie rallied. Because we were alone, we could dim the lights, enjoy the quiet of no machines bleeping, chat and play music. In the past, Donnie had enjoyed Van Morrison, Leonard Cohen, calming whale song type music and Chopin. On this night, it was slow Jewish music with a song referencing part of his Jewish name, a recurrent track. At one point, Marcel stroked his head - a small pleasure Donnie had always loved. Even in his semi-conscious state, it was apparent that he felt it, and his little body visibly relaxed. After a week without food, and an additional three days without food or fluids, he clearly felt soothed and we were glad. In the early hours of the morning, Donnie’s breathing became shallower and more spread out. By 8am, when Donnie's attending consultant arrived, Donnie was breathing just once every 3-5 minutes and his heart rate was slowing. 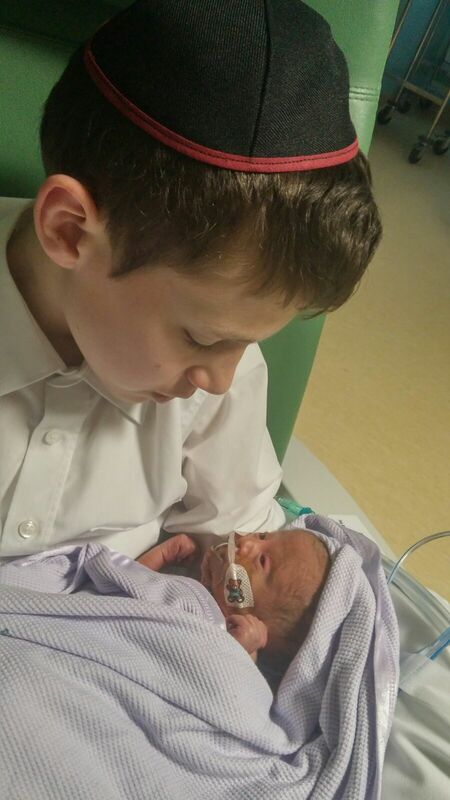 At 9.20am, she listened to his chest and told us that she couldn’t hear a heartbeat. Donnie had died in my arms. And it was meaningful to us both that he had waited for this special doctor to be there - the doctor who had meticulously and robustly cared for him when he was 1 and 2 weeks old, who had cared for him with the deepest kindness in his last week and with whom we had bonded over Donnie. I stayed with Donnie as staff from the unit came to say goodbye. 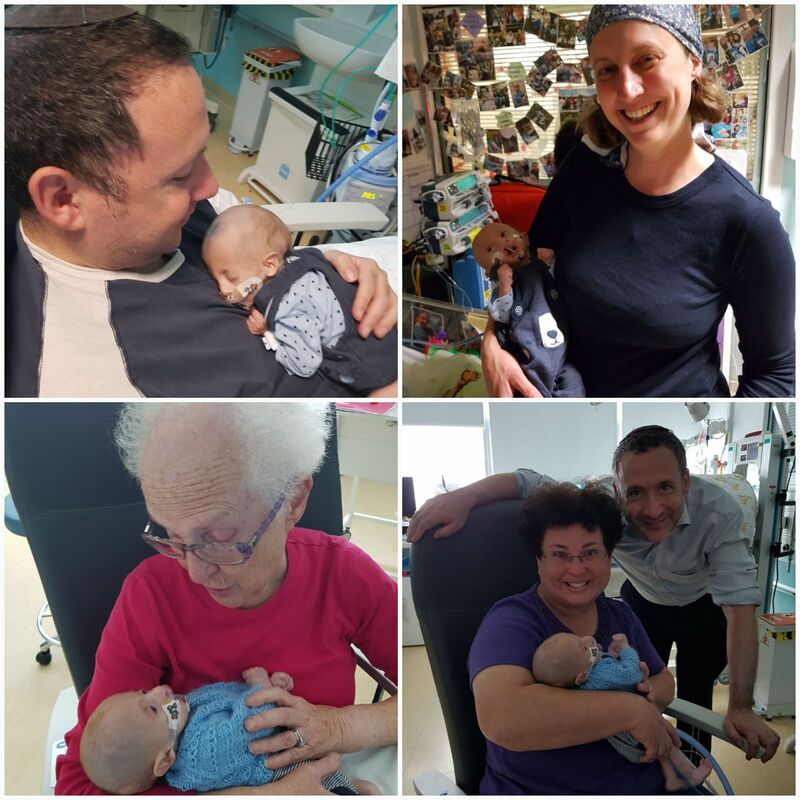 And for more than two hours a steady stream of staff came – nurses who had spent shifts looking after Donnie, doctors who had cared for him and other staff who had supported from a distance. And the children came to see Donnie and say goodbye too. Throughout this time, Marcel pushed hard to get the paperwork completed, which would ensure Donnie could be buried quickly in keeping with Jewish tradition. Though I was still holding Donnie, reflecting on the moment he died and hoping a long queue or closed public office would work against us, the death certificate was issued quickly, the town hall was efficient and the mortuary stayed open longer than normal. At 12.15pm, I had to let Donnie go. And that was impossibly hard. I had held him for about 9 hours by then and carried him for over a year. I passed him to a lovely nurse who took him downstairs to the mortuary in a Moses basket. 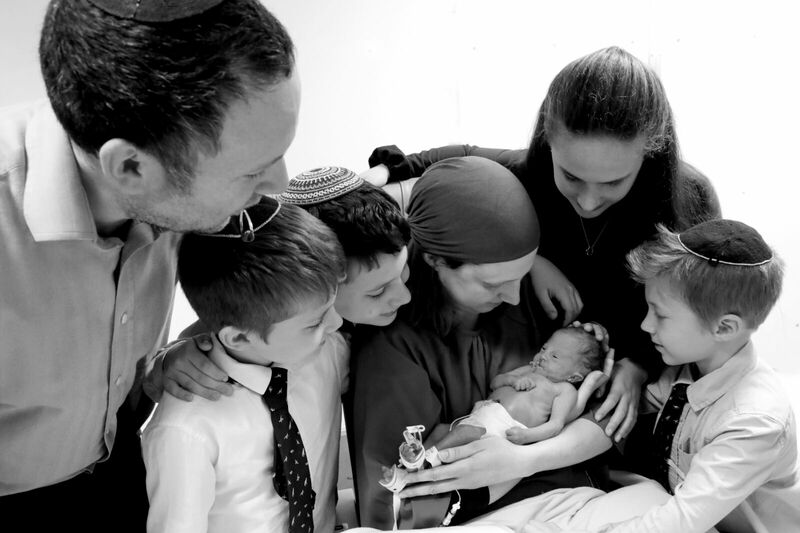 Once out of public view, she took him from the basket and held him in her arms until someone from the chevra kadisha (Jewish Burial Society) arrived. I had asked a close friend who stayed with her to make sure the person collecting him was a nice man. And he did. And then we made our way to cot 19 - Donnie’s cot. It was surrounded by a gallery of memories which I carefully dismantled with the help of one of our lovely friends on the unit. As I did so, I knew that people would remember it because no baby on the unit had had a gallery like that before – though maybe others will. We made our way home and on to the cemetery. And at 3.30pm Donnie was buried. In the middle of a dark and rainy day, a window of beautiful sun shone on the funeral - a typical day for Donnie. 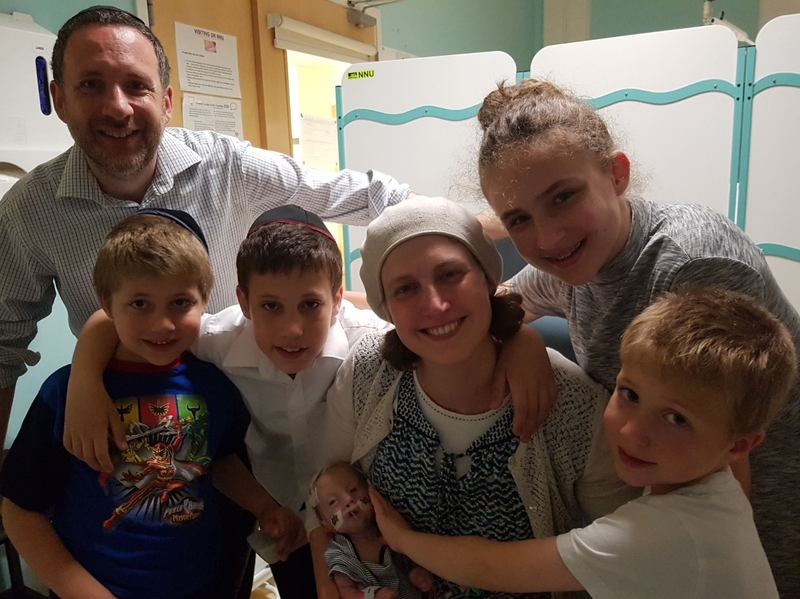 At just a couple of hours’ notice, hundreds of people came – friends of ours, friends of the children, family, community, colleagues, staff from the children’s schools and staff from the hospital. We were there as a family as we had been all along, I gave the eulogy and Marcel added some words, announcing the establishment of Donnie’s Fund. For everyone who could be there, thank you. We didn’t see most of you but we felt carried by you all. Hundreds of people came through the doors of our home last week. And each day when I thought there were no more to come, more came. And as they came, our house ran itself - there were rotas for food, managing the kitchen, doing laundry, taking the boys to school and collecting them afterwards. And these rotas were organised by a handful of the most special friends who ensured that people and food appeared throughout the week as if by magic. And people came from every part of our lives – childhood friends, teenage friends, university friends, friends with whom we have lost touch and friends from abroad who happened to be in the country; parents of friends and friends of parents, the children’s friends, parents of their friends and staff from the children’s schools; neighbours, community members, family members and family of family members, colleagues and staff from the hospital. And this last group was the most unexpected and the most immediately comforting because they knew Donnie. They had been on the journey with us – a journey which was at different times difficult and heart-breaking and heart-warming and collaborative but above all respectful. 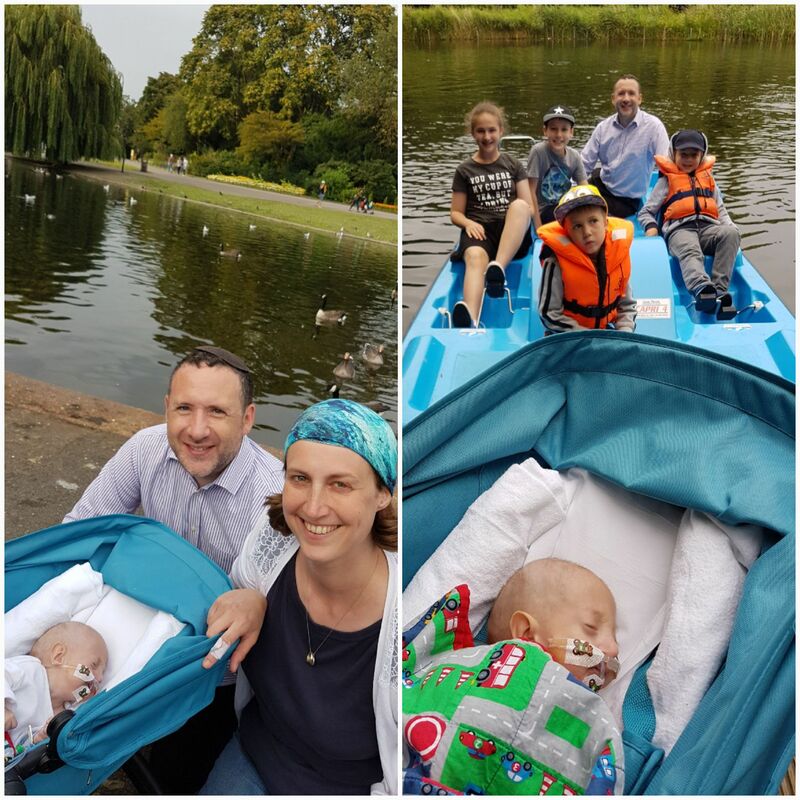 A journey which started in different places but which became a joint one as we agreed a treatment plan with which we were all comfortable, ensured it was followed meticulously and worked together ensure Donnie wasn’t just kept alive but lived. “Thank you for coming to comfort us and remember Donnie. Please do not feel you need to distract us from thinking or speaking about our loss. If we feel up to talking we will want to talk about Donnie's life and legacy. If we do not feel like talking, or you are worried about finding the words, your presence alone will be a comfort. 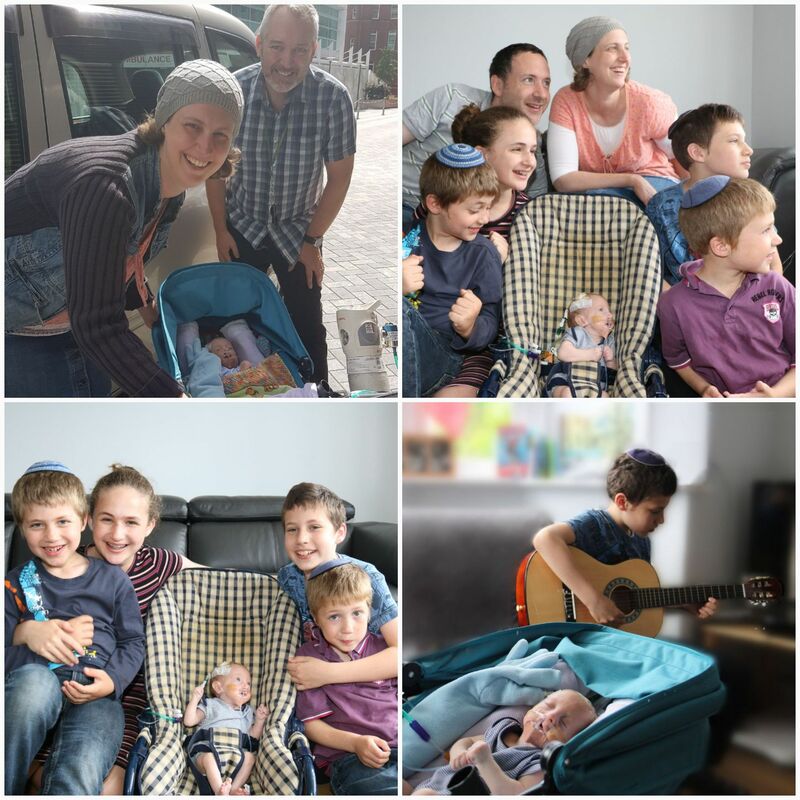 We had read about this idea online and we thought it would help people who visited us - lots of people had reason to be nervous coming through our door; the teenagers who had never been to a shiva, people who didn’t know us well and those who did but did not know how they would comfort a family who had lost a son and sibling. The shiva was exhausting but also a transition. As people came who normally fill our lives, we could see them filling our lives again. Nearly. Because although we didn’t bring Donnie home, we did bring home special memories, friendships and connections to a wonderful place where Donnie lived the entirety of his life and to which we will surely remain connected.